Posing casually on the back of a bench, Napoleon’s Army Soldier Statue represents a local legend that sprang from the French imperial army's time in the Slovak capital. The bronze statue stands in the city's main square with his hat at a jaunty angle, casually surveying the crowds. As the story goes, the soldier fell in love with a Bratislavan girl and ended up staying for the rest of his life. Many visitors pose for a picture with the famous soldier, imitating his pose by standing at his side with crossed arms. 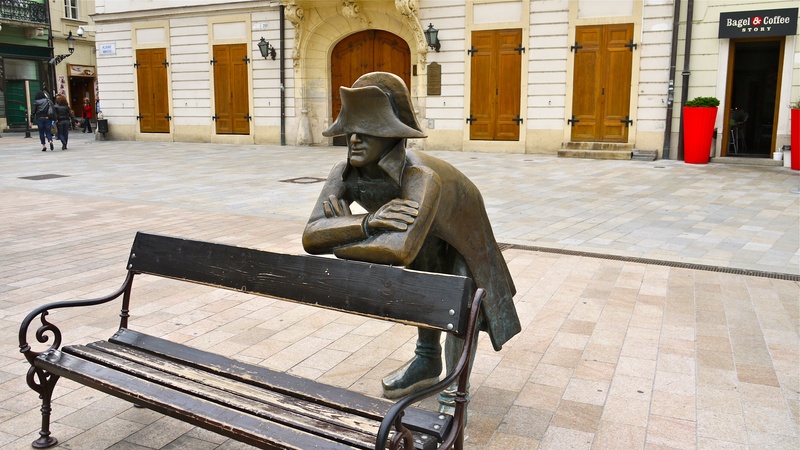 Put Napoleon’s Army Soldier Statue into our Bratislava trip itinerary maker site and find out what's close by, where to stay, and where to head next. Travel to Vienna visited Bratislava for the second time. Unfortunately not found on Town Hall square monument to the Napoleonic soldier. Bench on which drew soldiers on site, traces of fastening of the monument are visible; and no soldier. I would like to believe that it is not "retired" with someone's help, but simply the restorers work with him and returned to the place. Us this very monument is likable, so hopefully after a while, read about his return to the area. The figure of the soldier by Napoleon is apparently just restored. What a pity. I would have with that like to seen. Only the footprints remained so. Travel Tip: During a day trip by train from Vienna, it runs from central station to the Slavin 20 minutes - there are lots of stairs. Then it goes from there another 20 minutes to the Castle. Then we go in approx. 20 minutes to the blue Church. You can spend the noon/afternoon then wonderful old town before it again goes back on the night train to Vienna. This famous statue represents a soldier of Napoleon, who arrived in the city, fell in love with a woman and never came back. Worth the click! Every day, we help thousands of travelers plan great vacations. Here are some tips on how to use your Listing Page to attract more travelers to your business - Napoleon’s Army Soldier Statue. 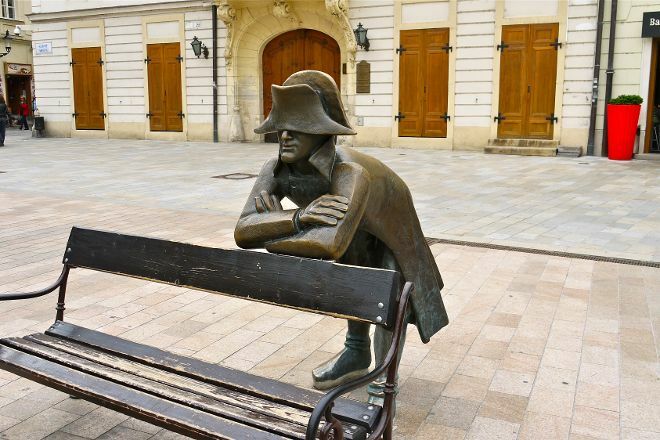 Promote your permanent link - https://www.inspirock.com/slovakia/bratislava/napoleon-s-army-soldier-statue-a3163818077 - on your website, your blog, and social media. When a traveler builds a plan from this page, the itinerary automatically includes Napoleon’s Army Soldier Statue. This is a great way for travelers looking for a great vacation in your city or country to also experience Napoleon’s Army Soldier Statue. Promoting your link also lets your audience know that you are featured on a rapidly growing travel site. In addition, the more this page is used, the more we will promote Napoleon’s Army Soldier Statue to other Inspirock users. For best results, use the customized Trip Planning Widget for Napoleon’s Army Soldier Statue on your website. It has all the advantages mentioned above, plus users to your site can conveniently access it directly on your site. Visitors to your site will appreciate you offering them help with planning their vacation. Setting this up takes just a few minutes - Click here for instructions.